Daniel Gaumer was born on March 25, 1814 or April 12, 1814 in Southampton Township, Somerset County, PA, the son of Johann "Richard" and Mary Ann Gaumer. He also has been named as "David" in census records. As an adult, he remained in Southampton, where in about 1833 he married Elizabeth Korns (Feb. 12, 1815-1864), the daughter of Daniel and Elizabeth (Reiber) Korns of Southampton Township. The couple had a dozen children. Among the 11 known names were Delilah Gaumer, George Gaumer, Rebecca Gary, Elizabeth Gaumer, Solomon Gaumer, Julia Ann Gaumer, Hannah Gaumer, Edward Gaumer, Simon Gaumer, Lavina Jordan and Minerva Gaumer. They were farmers in Southampton Township as shown on the federal census enumerations of 1850 and 1860. Tax lists published in the Somerset Herald circa 1846 show that Daniel served as tax collector in the township as well. He served as administrator of the estates of the late Henry Kennel and Samuel Witt, both in 1847. Elizabeth only survived her husband by eight months. She joined him in eternity on Sept. 4, 1864. They rest in the Cook Cemetery in Wellersburg, but their graves are not marked. Their families are spelled out in the 1991 book The Reiber Genealogy: The Descendants of Jacob Reiber, the Immigrant Ancestor of Sandhofen, Germany, 1727-1810, and Later of Lehigh County and York County, Pennsylvania, authored by John Raymond and Edith Fae (Boyer) Reiber (625 pages). The couple is named in Clyde Everett Corn's 1957 book History of the Corn Families of the U.S.A. (206 pages) and also in the 1949 book The Genealogy of Michael Korns Sr. of Somerset County, Pennsylvania, authored by Charles Byron Korns (Berlin Publishing Company, 262 pages). Their families also are spelled out in the 1991 book The Reiber Genealogy: The Descendants of Jacob Reiber, the Immigrant Ancestor of Sandhofen, Germany, 1727-1810, and Later of Lehigh County and York County, Pennsylvania, authored by John Raymond and Edith Fae ( Boyer) Reiber ( 625 pages). Many of their children also moved to Iowa. daughters Elisabeth Ann (1858) and Delilah (1860) rest for all time. 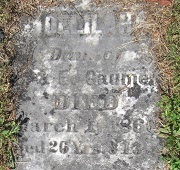 Daughter Delilah Gaumer (1834-1860) was born in about 1834 in or near Southampton Township, Somerset County. She apparently never married. Tragically, just 13 days after reaching her 26th birthday, Delilah died on March 1, 1860. Her remains were placed into eternal repose in Cook Cemetery. Her grave marker -- laying flat on the ground -- was photographed by the founder of this website in September 2016. The inscription reads that she was the spelling out that she was the "Dau. of D. & E. Gaumer." Son George Gaumer (1835-1868) was born on Sept. 8, 1835 in Southampton Township. Following in the steps of his uncle and aunt, Samuel and Susanna (Korns) Gaumer, he is known to have migrated to Iowa, where he settled in Iowa County. At the age of 34, on April 1, 1866, he was united in marriage with Sarah A. Carroll ( ? - ? ), daughter of W.J. and Jane Carroll. During their brief wedded life, they bore two known sons, William "Norman" Gaumer and George G. Gaumer. Sadly, George died just two years after their nuptials, just two days before Christmas 1868, at the age of 33. Interment was in Calvary Cemetery in Victor, Iowa County. In about 1871, after more than two years of mourning, Sarah married a second time. Son William "Norman" Gaumer (1867- ? ) was born in about 1867. He married Effie S. Pryor ( ? - ? ). The Gaumers produced three children. Son George G. Gaumer (1869-1892) was born in January 1869 in or around Victor, IA, about a month after his father died. He only lived to the age of 23 years, minus one day, and succumbed on Jan. 2, 1892. Burial was in Calvary Cemetery in Victor, Iowa County.. Daughter Rebecca Gaumer (1836-1903) was born on June 17, 1836 (or 1837) in Southampton Township, Somerset County, PA. When she was age 19 or 20, in 1856, Rebecca married William Henry Gary (March 20, 1832-1911). They were the parents of nine offspring, of whom the following are known -- Dr. Isaiah "Clark" Gary, Daniel W. Gary, Katherine "Elizabeth" Ingram, Simon P. Gary, George E. Gary, James N. Gary and Clara Gary. Two others were deceased by 1900. Early in their marriage, the Garys dwelled in William's home region of Cumberland, Maryland but by 1860 had moved back into Pennsylvania. Sometime between 1867 and 1869, they migrated to Iowa, settling on a farm in Highland, Tama County. They are shown in Tama in the 1870 and 1880 federal censuses. In 1880, the federal census taker recorded that Rebecca and their 19-year-old daughter Katherine Elizabeth were inflicted with erysipelas, a form of bacterial skin infection. The 1900 census shows William and Rebecca living as empty nesters, but with several farmhands living under their roof in Highland Township, Tama County. Rebecca passed away at the age of 66 on Sept. 1, 1903. Her remains were placed into rest in Maple Hill Cemetery in Montour, Tama County. William survived his wife by eight years and went to live in the household of his married daughter, Lizzie and Fred Ingram. He joined her in death at the age of 77 on March 27, 1911. Son Dr. Isaiah "Clark" Gary (1858-1935) was born on March 4, 1858 in Cumberland, MD and migrated to Iowa as a boy. In 1889, at the age of 31, he was wedded to 23-year-old Iowa native Minnie (Nov. 1865- ? ), and they bore a daughter, Ethel Gary. At the age of 26, in 1884, he earned a medical degree from Northwestern University in Chicago. Clark became a physician and practiced in Chicago for 46 years, from 1889 until his death in 1935. Among other accomplishments, he founded People's Hospital located at 255 West 22nd Street, a training school for nurses and served as its superintendent from 1897 to his passing. Circa 1900, the Garys made a home for 11 boarders and roomers in their residence. Later in life, he may also have married Emma ( ? - ? ), but the couple did not reproduce. They dwelled at 253 West 22nd Street in Chicago in 1935. At the age of 77, on the Fourth of July 1935, Clark died in the People's Hospital "after an illness of several weeks," reported the Chicago Tribune. Granddaughter Ethel Gary (1891- ? ) was born in June 1891 in Chicago. Son Daniel W. Gary (1859- ? ) was born in Aug. 1859 in Pennsylvania. He migrated as a boy to Iowa and helped his father with farm labor. In 1895, he was joined in wedlock with Ida H. (Sept. 1869- ? ), who was a decade younger. Their known children were Myrtle I. Gary and Maurice D. Gary. They lived on a farm in Highland Township, Tama County, IA in 1900. Sadly, Daniel died during the decade between 1900 and 1910. The U.S. Census of 1910 shows the widowed Ida heading a household along the state road in Howard Township, Tama County, with both children in the home, and she earning her "own income." By 1920, she had relocated into the town of Montour, Tama County, and shared a home with her son and married daughter and son-in-law. Granddaughter Myrtle I. Gary (1898- ? ) was born in June 1898 in Tama County. She was joined in marriage with Harold Bridges (1896- ? ). They lived with Myrtle's widowed mother in 1920 in Montour, Tama County, IA, and Harold earned a living as a hardware store clerk. Grandson Maurice D. Gary (1899- ? ) was born in Nov. 1899 in Tama County. In 1920, unmarried at the age of 20, he had no occupation and resided at home. Daughter Katherine "Elizabeth" (or "Lizzie") Gary (1861- ? ) was born in about 1861 in Pennsylvania and came to Iowa as a girl. Unmarried at the age of 19 in 1880, she suffered from erysipelas, a form of bacterial skin infection. In 1882, at the age of 21, she was wedded to 22-year-old farmer Fred Ingram (Oct. 1859- ? ) -- also spelled "Ingraham" -- a native of Canada whose father was Irish. They produced two known offspring -- William Ingram, born in Iowa; and (?) Ingram, born in Nebraska. Fred apparently brought a son to the marriage, Emmon Ingram, born in Canada. The federal census of 1900 shows the combined family living on a farm in Highland Township, Tama County, IA. In 1910, still in Tama County, they provided a home for Lizzie's aged, widowed father. The couple moved into the town of Tama during the 1910s and lived there on 9th Street in 1920, with Fred having no occupation, and married daughter Pearl in their home. Grandson William F. Ingram (1883- ? ) was born in Oct. 1883 in Iowa. He was unmarried in 1910 at the age of 25 and earned a living helping his father with farm labor. Granddaughter Pearl B. Ingram (1887- ? ) was born in June 1887 in Nebraska. She wedded (?) Dana ( ? - ? ). In 1920, married, she did not live with her husband but rather with her parents in the town of Tama, Tama County. Stepson Emmon (or "Emerson") Ingram (1876- ? ) was born in Nov. 1876 in Canada. As a 24-year-old, he lived with his father and stepmother in Tama County and provided farm labor. Son Simon Peter Gary Sr. (1863-1944) was born in about 1863 in Pennsylvania. A small boy when the family relocated to Iowa, he grew up assisting with chores on the family farm. When he was 33 years of age, in 1896, Simon became a lawyer, was admitted to the Illinois Bar and relocated to Chicago. His name appeared in newspapers in August 1899 when he was named to help investigate the officers of the American Home-Finding Association -- all pastors -- whose accounts were in question. That same year, with Swen Linderoth and Jones T. Beckman, Simon was an incorporator of the Alhambra Ceramic Works in Chicago. In 1901, at the age of 38, he was united in matrimony with 32-year-old Amelia L. Rauch (1869-1912). The couple produced one daughter, Mildred Anderson. Simon added to his investment portfolio in 1906 as an incorporator of the Illinois Furniture Company in partnership with Louis Roscezweig and Sol. Finkel. His law office circa 1907 was at 59 Dearborn Street in the Windy City. Their dwelling in 1910, as shown in the federal census enumeration, was in Chicago's 2nd Ward, and their home in 1912 was at 3161 South Fifth Street. Sadness blanketed the family when Amelia died in mid-August 1912. Funeral services were held in the Second German Methodist Episcopal Church. Her death notice in the Chicago Tribune noted that she was the sister of F.A. Rauch and Mary K. Kamping. Circa 1914, he was president of the German National Life Insurance Company, reported by the Chicago Inter-Ocean as "honest, reliable and efficient." In September 1916, he was pictured in the Chicago Tribune as a "Reunited Progressive Republican Party" candidate for judge of the Municipal Court. By 1920, he had married again to Rosetta Busse (1888- ? ), whose parents were German immigrants. The second marriage produced two more children, Simon Peter Gary Jr. and Lois Case. The family made a home at 917 Lyman Avenue in Chicago's Oak Park community and remained there for decades. Simon died at home on March 7, 1944, at the age of 81. Funeral services were held in the Chicago Temple, and an obituary was published in the Chicago Tribune. Burial was in Graceland Cemetery. Granddaughter Mildred C. Gary (1904- ? ) was born in about 1904 in Chicago. She married (?) Anderson. Grandson Simon Peter Gary Jr. (1919- ? ) was born in about 1919 in Chicago. By 1944, he married Betty Lorraine Beeson and had produced a son, Simon P. Gary III. Sadly, their son died in Oak Park as he neared his second birthday on Sept. 4, 1945. Granddaughter Lois Gary (1922- ? ) was born in about 1922 in Chicago. She was joined in wedlock with (?) Case. Son George E. Gary (1865-1942) was born on Jan. 15, 1865 in Pennsylvania or Maryland. (Records differ.) He migrated with his parents to Iowa at the age of four. As a teenager, he provided work on the family farm. On March 20, 1890, he married Mary Martin (March 31, 1869- ? ), a native of New York City and the daughter of Tama County pioneers Robert and Margaret (Woods) Martin. The wedding was held in the bride's home. They had six offspring, Charles E. Gary, Grace Williams, William Gary, Mabel Hanify, Mary Weaver and Nellie Winders. Over the years, George became a "prominent Tama county farmer and extensive land owner," said the Waterloo (IA) Courier. "They lived for 27 years on a farm in Highland township three and one-half miles south of Montour. In 1917 they moved to an acreage in Toledo township and lived there and in Toledo for 14 years. In 1931 they moved to a farm owned by Mr. Gary in Crystal township and have resided there for the past nine years." From 1922 to 1931, George also served on the Tama County board of supervisors, including six years as board chair. He was active in the Masons and as a Highland Township official as well as a charter member of the Tama County Farm Bureau. Mrs. Gary belonged to the Nineteenth Century Club in Toledo and was a member of the Rural Housewives Club. When they reached their 50th wedding anniversary, a dinner was held for the family at Knotty Pine Cafe in Toledo, IA. On May 26, 1942, George succumbed at the age of 77 in Kocher Hospital in Toledo from the effects of high blood pressure. An obituary was printed in the Courier. Grandson Charles E. Gary (1891- ? ) was born in Dec. 1891 in Iowa. On March 10, 1915, he was married to (?). The nuptials were held in Tama, officiated by Rev. Cleoworth. The Garys had two sons, Ronald R. Gary and Gaylord E. Gary. They dwelled on the family farm in Montour, Highland Township. Charles earned a living as manager of the Tama County unit of the Iowa Poultry Producers Marketing Association. Charles also was a member of the Farm Bureau, president of the Montour National Farm Loan Association and president of Tama County Sales Company. The couple celebrated their 25th wedding anniversary in March 1940 with a family meal at Knotty Pine Cafe in Toledo, IA. Granddaughter Nellie M. Gary (1893-1981) was born in Oct. 1893 in Tama County. She was joined in wedlock with Russell Winders ( ? - ? ). Their two offspring were Robert Winders and Helen McIntyre. They lived in Toledo for decades and were members of Otterbein United Methodist Church. As a widow, Nellie relocated in about 1980 to West Des Moines. succumbed at the age of 88 in West Park Care Center in Des Moines. An obituary was published in the Des Moines Tribune. Burial was in Woodlawn Cemetery in Toledo. Granddaughter Grace Gary (1899?-1987) was born in Dec. 1899 in Tama County. She lived in Cedar Rapids, IA in 1940. She pursued a career and worked in the accounting department of Collins Radio Company. On Oct. 20, 1948, she was joined in marriage with farmer Isaac J. Williams ( ? -1978). The ceremony was held at Little Brown Church at Nashua, IA, with Rev. F.L. Hanscom officiating. Reported the Waterloo (IA) Courier, "Mr. Williams is a farmer in Muscatine county. In December the couple will leave for California, where they will spend the winter." Isaac died in 1978 after three decades of marriage. Grace lived for another nine years as a widow, maintaining a residence in Toledo. toward the end, she was admitted to Bethesda Care Center in Toledo, where she died on Dec. 28, 1987. An obituary was printed in the Davenport (IA) Quad City Times. Grandson William Gary made his home in Toledo. Granddaughter Mabel Gary ( ? -1993) was born in (?). She married Francis Hanify. They dwelled in Toledo in 1940-1981 and in Cedar Rapids in 1987. She died at the age of 87 in February 1993, with a brief death notice printed in the Des Moines Register. Granddaughter Mary Gary wedded Roy Weaver. In 1940-1987, their residence was in Toledo. Son James N. Gary (1867- ? ) was born in about 1867 in Pennsylvania. Daughter Clara Gary (1869- ? ) was born in about November 1869 in Iowa. Daughter Elisabeth Ann Gaumer (1840-1858) was born in about 1840 in or near Southampton Township, Somerset County. She was not fated to reach full adulthood. Heartache enveloped the family on Dec. 1858, when Elisabeth passed away at the age of 18. Burial was in Cook Cemetery, and a stone was erected at the grave. There is an inscription on the marker which is illegible today, spelling out that she was the "Dau. of D. & E. Gaumer." Son Solomon G. Gaumer (1842-1923) was born on June 4, 1842 in or near Southampton Township, Somerset County. Solomon moved west "in an early day," said an Iowa newspaper, and became a pioneer settler of Iowa, settling in Fairfield, Jefferson County. At the age of 29, on Oct. 5, 1871, he was united in marriage with teacher Annie Mary Stewart ( ? -1920), daughter of John B. and Frances (Barton) Stewart. The couple produced nine children, among them Dr. James "Stewart" Gaumer, Jessie May Gaumer, John Edward Gaumer, Dr. Rolla R. Gaumer, Frances B. "Fannie" Breniman, Bessie Gaumer, Charles C. Gaumer, Hugh D. Gaumer and Dr. Archie W. Gaumer. As newlyweds, they made their home in the town of Victor, IA. Beginning in 1873, said the Fairfield Daily Ledger, they "lived continuously in Center township, until 1910, when the family moved to Fairfield." Their farm was in Section 4. In January 1907, when a Fairfield Township tax controversy, he and T.C. Ross and Louis Barrow submitted a petition to establish territory outside of the town of Fairfield as a separate township. There was no opposition, and the matter was approved, thus creating Center Township. He is named in volume 1 of the 1914 book History of Jefferson County, Iowa: A Record of Settlement, Organization, Progress and Achievement, authored by Charles J. Fulton. ...been cared for there longer than any other patient who has ever been in the hospital. During all of this time he has retained his mental faculties, always knew his old friends and was interested in all that was going on about him. He has been a great sufferer and death has come in a welcome release after long months of anguish and pain. Mr. Gaumer was a man of quiet character who never aspired to public notice, was a kind father and a good neighbor. They are described and pictured in a 1977 book authored by their granddaugter, Mildred B. Belknap, This I Remember, Including Breniman and Gaumer Genealogy Notes (124 pages). The book notes that Solomon's birth paper was preserved in Mildred's cedar chest, a gift from her Aunt Bessie Gaumer. Son Dr. James "Stewart" Gaumer (1872-1946) was born in 1872. He was a, 1897 graduate of Parsons College in Fairfield and a 1900 graduate of Rush Medical College. Armed with his medical degree, he became a physician, with a practice in Fairfield, IA circa 1912-1923. He married Minnie Marie Corey ( ? - ? ), a 1896 graduate of Parsons College with a bachelor of science. They produced one son, Strewart Corey Gaumer. During the Spanish American War, he enlisted in the 50th Infantry, Company M, and served from April 26, 1898 to Nov. 30, 1898. In 1909, he served as coroner of Jefferson County. Husband and wife were active circa 1912-1913 in the college's Alumni Association, with Minnie on the executive committee and James on the editorial staff of The Alumni Quarterly. During World War I, he served as a medical officer and lieutenant with the ambulance company of the Iowa National Guard. Stewart's aged father resided with them for a time up to his death in 1923. Stewart affectionately was known as "Uncle Doc" to his nieces and nephews. They are named in a book authored by their niece, Mildred B. Belknap, This I Remember, Including Breniman and Gaumer Genealogy Notes (124 pages). He was named to the Fellowship of the American College of Physicians in 1920 at a meeting of the American Congress of Internal Medicine, and held this honor for 26 years until death. He passed away at Fairfield on Sept. 10, 1946. Son Stewart (1918-2005) died on June 13, 2005 after a very active career in Fairfield. Son John "Edward" Gaumer (1876- ? ) was born in about 1876. He is believed to have been a pharmacist and to have been licensed by the Iowa Board of Pharmacy (#6681). He was twice married. His first bride was Nellie Teachnor ( ? -1923). Sadly, Nellie died in 1923. After a year as a widower, John was wedded to Lea Krum ( ? - ? ). They resided in Denver in 1923 and later San Francisco, CA. Son Dr. Rolla R. Gaumer dwelled in Galesburg, IL, where he had a dental practice. Daughter Frances B. "Fannie" Gaumer ( ? - ? ) married Ernest Eugene Breniman (1870- ? ). Their home circa 1923 was in Brooklyn, IA. Ernest attended a Des Moines business college for a year. They met at a wedding of Ernest's cousin Ella Brenimen (daughter of Matilda Gaumer) and George Freese. The couple had several children, among them Mildred Belknap. Mildred attended Parsons College in Fairfield and there met her husband, Lester Belknap. Daughter Bessie Pearle Gaumer (1885-1960) was born in about 1885. She was unmarried and lived in Fairfield, IA in 1923. She was loving and generous to her nieces and nephews, and once gave a niece funds to travel to Detroit to attend a student volunteer convention. She was a member of the Daughters of the American Colonists, carrying member #11565. Said the Fairfield Daily Ledger, she was "was employed for a number of years at the Iowa Malleable Iron company. She was later employed in the county auditor's office until her retirement nine years ago. She was a member of the Methodist church, Chapter C, PEO, Order of Eastern Star and the Women's club." She died in 1960 and was interred with her parents and brother Hugh. Son Charles C. Gaumer resided in the early 1920s East Moline, IL. Son Hugh Donald Gaumer (1889-1947) was born in about 1889. He married Esther Crowel ( ? - ? ). He relocated to California and in 1923 was in San Francisco. He passed away in 1947 and his body placed into repose in Evergreen Cemetery in Fairfield. Son Dr. Archie Winnett Gaumer (1878-1920) was born in 1878 in Fairfield. After completing his common school education, he attended a college of dentistry at Keokuk, IA and became a dentist. He established a long-time practice in Bloomfield, IA. During World War I, he was commissioned as a first lieutenant and served in the Army. In 1919, he opened an office in Des Moines. He married Edith Anschutz (1877-1945) but did not reproduce. In 1920, in failing health, he and his wife made their home with her parents in Fairfield. In July of that year, he traveled to Quincy, IL to visit for a week, but his health failed, and he passed away on July 21, 1920, at the age of 42. Burial was in Evergreen Cemetery in Fairfield, with an obituary printed in the Burlington Hawk-Eye newspaper. Edith survived her husband by a quarter of a century and apparently remained in Fairfield. She died there on Aug. 16, 1945. Burial was with her husband in Evergreen Cemetery. 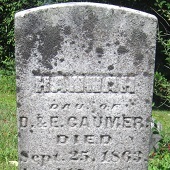 Daughter Hannah Gaumer (1846- 1863 was born in about 1846 in or near Southampton Township, Somerset County. As with her elder sisters Elisabeth and Delilah, Hannah was doomed to an early death. The Grim Reaper swept her away at the age of 17 years, eight months and 17 days on Sept. 25, 1863. 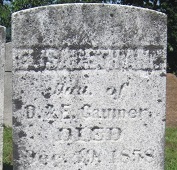 Burial was in Cook Cemetery in Somerset County. A stone marker was placed at her grave, and an epitaph was inscribed at the base -- legible when photographed in September 2016 -- reading "Weep not, she is not dead but sleepeth." Son Edward Gaumer (1848- ? ) was born in about 1848 in or near Southampton Township, Somerset County. Son Simon Gaumer (1848-1932) was born in 1848 in Southampton Township. At some point in time he migrated to Iowa, settling in Victor, Hartford Township, Iowa County. In about 1874, when he was 26 years of age, Simon married Amanda Manat (May 1854- ? ). They produced three known daughters, Lura Belle Gaumer, Vivian Maude. Gaumer and one who died young. In 1880, census records show that they dwelled in Victor. By 1900, their home was in Des Moines, IA. There, Simon worked as a teamster (driver) for a transfer company. That year, 18-year-old Amanda F. Reed boarded in the home, and 53-year-old Albert Thurlow was a lodger. With both daughters having married by 1910, the Gaumers shared a home with both couples in Des Moines in 1910, with Simon working as a freight overseer for a transfer business. By 1920, they and the Murvins moved to a new dwelling on 17th Street in Des Moines. Simon passed away in 1932 at the age of 84. Daughter Lura Bell Gaumer (1875- ? ) was born in June 1875 in or near Victor, Iowa County. At the age of 24, unmarried, she lived with her parents in Des Moines but had no occupation. At about the age of 30, in 1907, she was joined in matrimony with James R. Murvin (1877- ? ). They are not believed to have reproduced. A native of Pennsylvania, James earned a living as a collector for a retail furniture firm. In 1910, Lura Bell and James shared a home with her married sister and brother in law and aged parents. The Murvins moved to a new home during the decade of the 1910s on 17th Street in Des Moines and continued to provide a residence for Lura Bell's parents. In 1920, James continued his occupation as a collector for a Des Moines retail furniture business. Daughter Vivian Maude Gaumer (1881- ? ) was born in May 1881 in Iowa. She earned a living at the age of 19 as a clerk in a Des Moines notions store. In about 1903, she was joined in marriage with Henry Thompson (1881- ? ), a native of Ohio. The couple established a residence in Des Moines and took in Maude's parents and married sister and brother in law by 1910. The couple bore one known son, Merle E. Thompson. The federal census enumeration of 1910 shows Henry employed in Des Moines as a draper in a furniture store. Grandson Merle E. Thompson (1906- ? ) was born in about 1906 in Des Moines. Daughter Lavina Gaumer (1852- ? ) was born on Aug. 20, 1852 in or near Southampton Township, Somerset County. She married Samuel Jordan (1850- ? ). Daughter Minerva Gaumer (1855- ? ) was born in about 1855 in or near Southampton Township, Somerset County.